I’ve chosen Patrick Morrison and Glen Baxter to exhibit with me for various reasons, most importantly the fact that their work genuinely entrances me. To that add the fact that they both currently work on paper, as I do, and this intrigued me because I am very much in love with paper. I had always known Patrick Morrison’s work as very bright and vibrant. His paintings were almost moving on the canvas – very much alive with impossible colors, thick and beautifully contrasting each other, almost wrestling each other. I had heard rumors of something new brewing in his studio, and when I went to visit him earlier this year I walked into an explosively different world. His new series has a rough and haunting air to it that immediately involves one emotionally and makes one an accomplice to that world. His dark, monochromatic black and gray scenes reminded me of the underbelly of an anonymous city, or dreams lurking at the back of one’s head. Painted in acrylic and oil on paper, these paintings are gracefully sloppy, with dark, translucent layers dripping over the scenery — sometimes revealing hints of red or yellow glowing underneath. Patrick’s studio walls were covered with these works, and then he pulled back his studio rug and pulled more works from underneath. I thought this very appropriate for an Irish man. I had been a fan of Glen Baxter’s work since the age of fifteen. I’ve had old exhibition invites of his taped to my fridge, his posters on my wall, photocopies of his drawings framed and hanging in my bathroom. There is so much wrong with this world, aesthetically speaking (not that it’s perfect in other ways, either), but Baxter’s work has always helped level that out for me a little. His work feels right in the marrow of my bones. 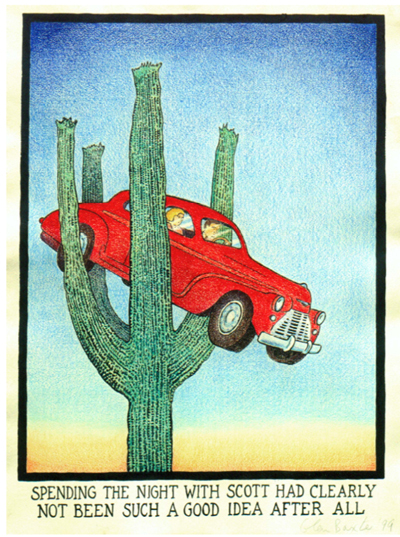 Very far removed from Patrick’s dark, dreamlike paintings on paper or my own oil pastels, Glen Baxter inhabits his world with cartoon-like cowboys fiercely enmeshed in adventures with modern art. That, or far weirder scenarios involving explorers, vintage school kids, detectives and a variety of props — cacti, for instance, or bizarre contraptions that people wear on their heads. 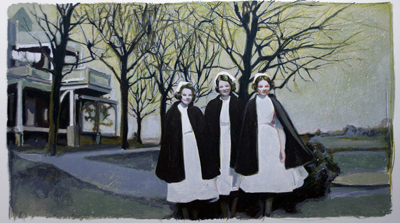 “Weird” is a very important adjective, the operative one in describing Baxter’s work. And since that word also encapsulates a quality very dear to my heart, I fell for his work. Glen Baxter is the master of weird. I couldn’t be more thrilled with the company I am dragging along to my exhibition, and I am very thankful to them for agreeing to let me do so.